"The Unconventional Blossom 矫情之花 (jiǎo qíng zhī huā)"
Wife of Zhou Yu 周瑜 and younger sister of Da Qiao 大乔, Xiao Qiao is the starry-eyed girl next door famous for her musical talent. As explained in my post on Da Qiao, the two sisters were one of the major reasons for the Kingdom of Sun Wu 孙吴 going to war with the Kingdom of Cao Wei 曹魏, which quickly resulted in the battle of Red Cliffs 赤壁之战. Xiao Qiao was notably more vocal and expressive than her aloof elder sister, thus it seemed like Xiao Qiao was the more musically talented of the two, but it has been argued that Da Qiao is equally skilled in music and just chooses to play only for her beau Sun Ce 孙策. 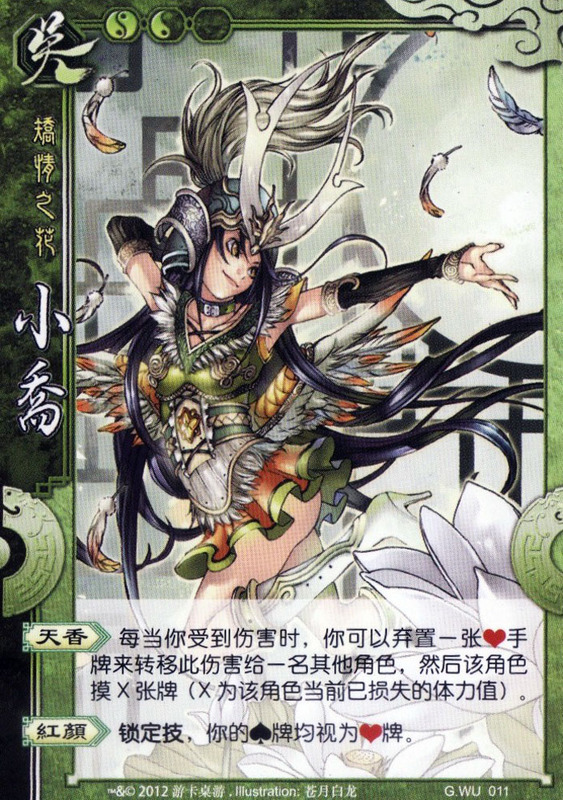 Character ability 1: "Heavenly Scent 天香 (tiān xiāng)"
Every instance you receive damage, you can discard an on-hand card with suit of hearts to transfer the damage to another player, then that player draws X cards (X being the units of health that player has lost thus far). Your cards with the suit of spades are viewed as cards with the suit of hearts. Unfortunately, since she is Zhou Yu's wife, she also suffers hideous disfigurement of her portrait. Otherwise, she is unchanged. Neither of her abilities have any link to the story. Despite her "Heavenly Scent" being horrifyingly powerful, there is just no mention in the story about anything related to her scent doing demonic damage. Although the abilities were not directly linked to the story, there were some hints. “国色天香 (National Beauty, Heavenly Scent)” was a term to describe the beauty of flowers and women. Since Da Qiao gets “国色”, Xiao Qiao gets “天香”, which also suits their given titles (“The Preserved Blossom” and “The Unconventional Blossom”). The ability mechanism resembles another ability of Da Qiao, “Displacement”.